Teaching writing is a stress inducer for a lot of teachers. Engaging Writing is here to help! During my first couple years of teaching, writing time was THE area that frustrated me the most. Many techniques and strategies I read about and tried to implement just muddled the “art” of it. They took up far too much time. Overall, they missed the mark with my little ones. Honestly, I dreaded my writing block. Over the years, I’ve had lots of discussions with peers about the struggle with teaching writing. Understanding this is an area of frustration for many teachers, I am thrilled to share with you a complete, easy to follow and implement, and extremely effective writing program. Because it is FILLED with OODLES of goodness, Engaging Writing is a teacher’s dream! It simplifies the writing block. Most importantly, with Engaging Writing, kiddos master those writing standards and become strong, confident, non-reluctant writers. Each lesson is CCSS aligned with 1st and 2nd grade standards and standards mastery focused. Lessons, visuals, read-alouds, practice and application develop skill mastery within these standards. The program is genre specific. The lessons increase student schema in narrative, expository and opinion writing genres. There are 10 weeks of instruction for each genre. It covers both 1st and 2nd grade skills. So, teachers who loop with their kiddos, have multi-age classrooms, or a group of students who require differentiated activities have 2-years worth of resources in one place! Engaging Writing is quick and simple. It requires minimal prep. The primary purpose is interactive learning through lessons and activities. The program includes a comprehensive, easy to use teacher’s manual. It guides writing instruction through quick and easy to implement daily lessons. The teacher’s guide file is ready to print and go. I took mine to Staples and had it bound. You could also use a comb binder to bind it, or even put it in a binder! 30 weeks of differentiated lessons are laid out in an easy to follow daily format. The included approximate/suggested lesson time icons help with planning. Each genre unit includes an organization and lesson summary sheet. Full-color anchor charts provide quick display opportunities. The graphic reminders are a tremendous support for students (and teachers). They are also color-coded to match the components of each 10 week genre lesson. Reading and listening to awesome writing is a fabulous way to better understand HOW to write. Engaging Writing™ includes lists of children’s books that are a perfect addition to any classroom library! The text, genre components, and illustrations provide terrific examples of excellent writing. The student resource reproducible file is HUGE! It contains everything you will need to copy for your kiddos. Resources are provided for beginners and advanced primary writers based on 1st and 2nd grade writing standards. This file is kept separate from the teacher’s guide to ensure ease of use and copying. The Interactive Flip Book provides student support throughout each 10-week unit. This key component quickly and easily covers each aspect of the writing genre in detail using key words, definitions and examples. The Writers Quick Reference is a writing tool for the entire year. Beyond the lessons, there are extensive and differentiated activities. Engaging Writing™ includes complex text. Complex text is an important literacy development component. Students use text-based evidence and answers in genre specific tasks. Because practice is imperative, Engaging Writing includes lots of practice opportunities for all three genres. As a result, this practice increases student writing skill schema, allows for differentiation and “leveling up” growth, too! Informational text is another key Engaging Writing™ component. The NGSS standards for both 1st and 2nd grade are on many of the expository text practice pages. Cross-curriculum focus during class lessons fits in smoothly. The teacher’s guide includes the thumbnails for each of these pages. This “quick look” helps in quickly planning and prepping for the lessons. The teacher’s guide also includes answer keys for each of the student activity pages! Simplify your grading time – or better yet – get some grading assistance from a helper. Engaging Writing™ incorporates grammar practice sheets. These help students improve creativity and novelty in their writing style while mapping and organizing their thinking. Paragraph production and story writing concludes each unit. Students manage their thoughts and ideas in graphic organizers and writing plans. Finally, they conclude the unit writing detailed paragraphs on the provided stationery. The teacher’s guide includes a completed sample of ALL of these graphic organizers. ENGAGING WRITING IS COMPREHENSIVE, PRACTICAL, EFFECTIVE & TEACHER & STUDENT FRIENDLY! Engaging Writing™ is the complete package. Ultimately, Engaging Writing™ encompasses my passion for keeping things simple and effective. The program is everything you need for an effective writing block! It is an easy to use and implement alternative to the regiment of “workshop” style writing blocks. Additionally, it is a system superior to the lacking writing lessons included in many district ELA curriculum adoptions. 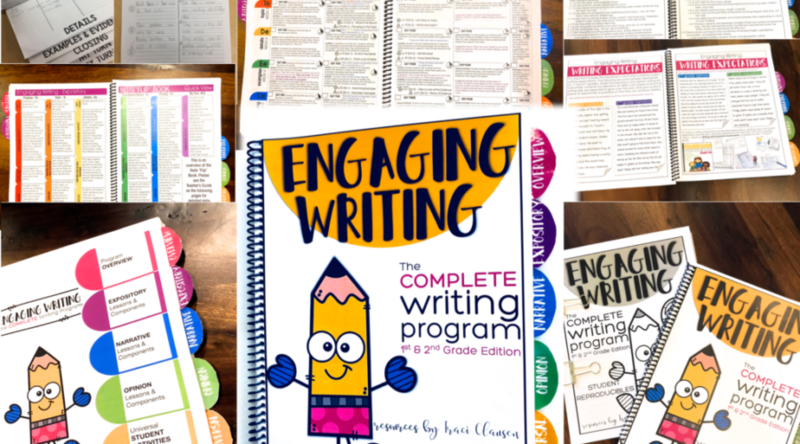 Engaging Writing™ is the answer to the writing block challenge! I developed Engaging Writing™ as a stand alone writing program. However, it also works amazingly well as a writing supplement. It adds the structure and steps necessary to build strong writing skills. Check it out! Watch your kiddos writing skills grow! How can I get these resources?